One thing I used to do more of was write a bit about gift etiquette. I’m hesitant to do it as much now because well, A) I’ve already written plenty about it, and B) everyone has their own standards. I’m not going to dictate how much a gift should cost, although by this point you’ve probably gathered I don’t regularly suggest gifts that are exorbitantly expensive. Regardless, I thought I’d start doing ‘help’ guides instead of etiquette, to give you a smidge of guidance or inspiration when shopping for various occasions. Valentine’s is a particularly tricky one, because so many people see it as a ‘Hallmark’ holiday, a corporate-driven affair that forces us to blow cash to show our affection – something we should be doing everyday (minus the cash-spending part, maybe). I’m indifferent because my anniversary is a week after V-Day, and I have my own tradition for that day which involves a sentimental gift as opposed to a purchased gift. That being said, a lot of people DO celebrate Valentine’s Day, so consider this (and the subsequent guy’s post) as ideas that aren’t for the haters. 1) If you’ve been dating for 3-4 months or less, skip the real ‘gifts’. Go out for dinner. Send flowers to her office. Surprise him with his favourite Starbucks drink. Buy a pair of heart-shaped cookies and stay in to watch a movie. Don’t make a big deal out of it, and keep your spend – and expectations – to a reasonable level. 2) If you’re in a longer-term relationship, you’ve probably had an honest talk about Cupid’s favourite holiday and what it does or doesn’t mean to the both of you. Gauge your gift-giving accordingly – maybe use it as an excuse to buy something you know they’ll love, romance-themed or not. Be forewarned: if you do something crazy splashy this year, you’ll forever be doomed to top it. 3) If you’re newlyweds, newly cohabitated, or just seriously head over heels kinda sorta annoyingly in love at the moment, consider getting something fun and flirty to keep that fire burning. 4) If you’re settled into the sweet & comforting groove of marriage (or common law), don’t think that Valentine’s is just for the kids. By the same token, don’t build up your expectations to crazy unreasonable levels either. Go out for a special evening and give each other a nice token of your affection. Dial it up or down depending on the type of year you’ve had. Did she just give birth to your first child? Give her a treat to remind her she’s super important to you. Did he just get a promotion at work? Celebrate it with an extra special treat. Do you have a major – 25 or 50 – year anniversary on the horizon? Turn down the volume a bit: you’ve got another major gift-giving occasion coming up. Still getting to know one another? 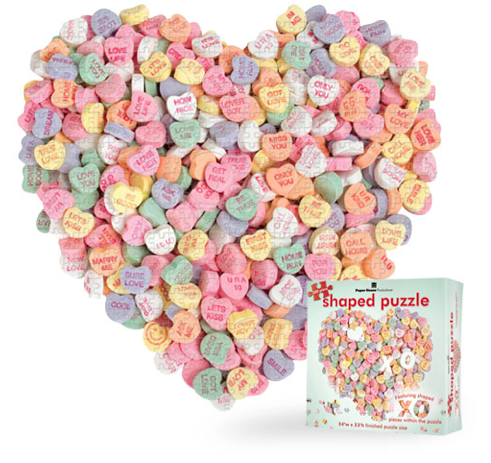 Spend an evening in and just talk, drink wine, and enjoy each other’s company over a fun, Valentine’s-themed puzzle. If you love the finished product, get it laminated (or use puzzle glue) and hang it up for a lifelong memory of those early days together. 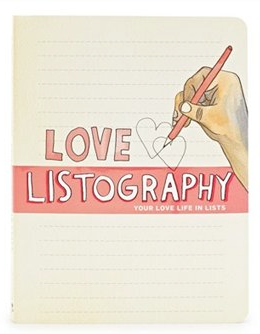 I love the entire series of Listography books, and this one is a fun and frivolous way to tip your hat to the holiday. If you’re unfamiliar, the concept is to basically make a list based on the provided topics. They can range from your relationship pet peeves (be sure to show him that page) to your favourite love songs (and maybe that one) to your favourite positions (and hey, that one as well) – all in the name of documenting your romantic mindset right here, right now. Everyone loves the idea of dinner – or kisses – by candlelight, but this simple beauty has a little trick up its sleeve. 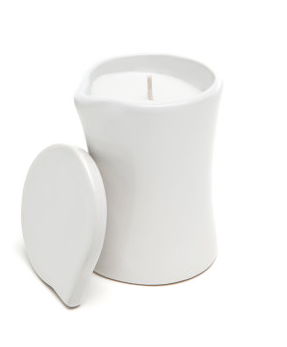 Once you blow out the candle, the wax transforms into a floral massage oil, perfect for a little post-dinner intimacy. I know, I know – it’s a pretty seismic price jump from items #1 to #3 to item #4, but there’s only so many occasions in which I could feature Canadian jewelery designer Mademoizelle Sefra’s collection of pretty baubles, and this seemed to be one of them. 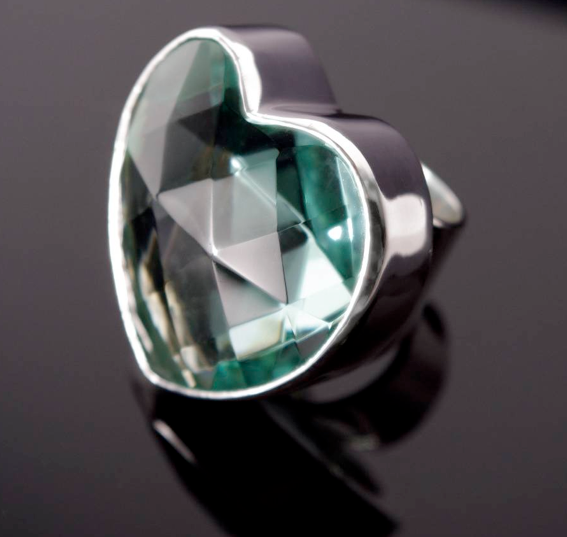 This stunning sterling ring is a true eye-catcher, and a fun way to make heart-shaped jewelery less costume and more cocktail.